Active Liver is manufactured in Sweden. The tablet is based on a herbal combination extract of milk thistle, artichoke, turmeric and black pepper plus the essential nutrient choline. Milk thistle and artichoke supports your normal liver function. 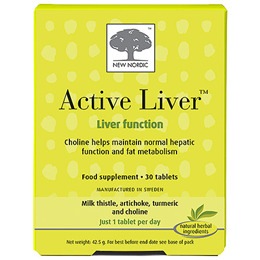 Choline helps maintain normal liver function and fat metabolism. Milk thistle extract (Silybum marianum L.), globe artichoke extract (Cynara scolymus L.), choline hydrogen tartrat, filling agent (microcrystalline cellulose), turmeric extract (Curcuma longa L), disintegrator (crosslinked sodiumcarboxymethylcellulose), black pepper extract (Piper nigrum, L), coating agents (vegetable magnesium salts of fatty acids, hydroxypropylmethyl cellulose, gum Arabic, talcum, glycerine), anti-caking agent (silicon dioxide), modified potato starch. 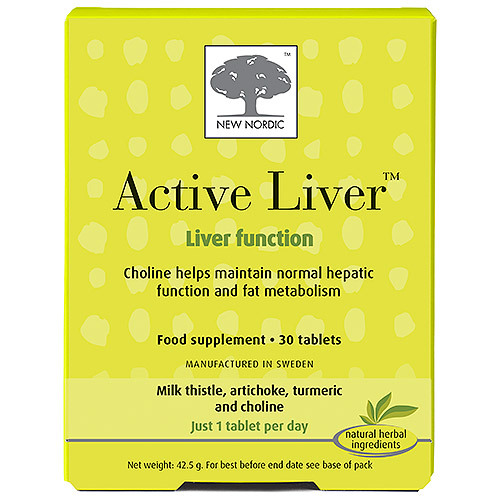 Below are reviews of New Nordic Active Liver - 30 Tablets by bodykind customers. If you have tried this product we'd love to hear what you think so please leave a review. I'm now on my second month taking this supplement and I think it's helping.